There is lots of concern up in the green bristol blog, where Chris Hutt has discovered that a bit of the greenery Bristol-Bath railway path is being sold off. It does set a bit of a precedent, but then that happened at the "dangerous Z-bend", the worst part of the path to walk or cycle, when about 15 years back the safe route was turned into housing, and us walkers and cyclists given a more entertaining route. The council decided to sell of bits of underused parkland a while back, and here is the first case of its use. All the greenery beside the railway path clearly meets this requirement, because it hasn't been used for a kite festival, balloon festival or other profit-earning use recently. Instead it is just unprofitable greenery with unprofitable things like badgers living in it. No more! Now as part of the Bristol Cycling City, a lucky few homeowners will be able to push straight out from their houses on the railway path! This is a wonderful development, as it enables the city to provide safe cycle routes for homeowners without having to inconvenience any of today's motorists, or upset FirstBus enough for them to call the council and demand an apology. Here's the best bit. If every house in the terrace takes up 5 metres of path. then the whole 21km of path has room for 4200 houses! On each side! We could deal with the government's demands for 10,000 new houses by building every single one along the path. The Bristol would truly become a cycling city! 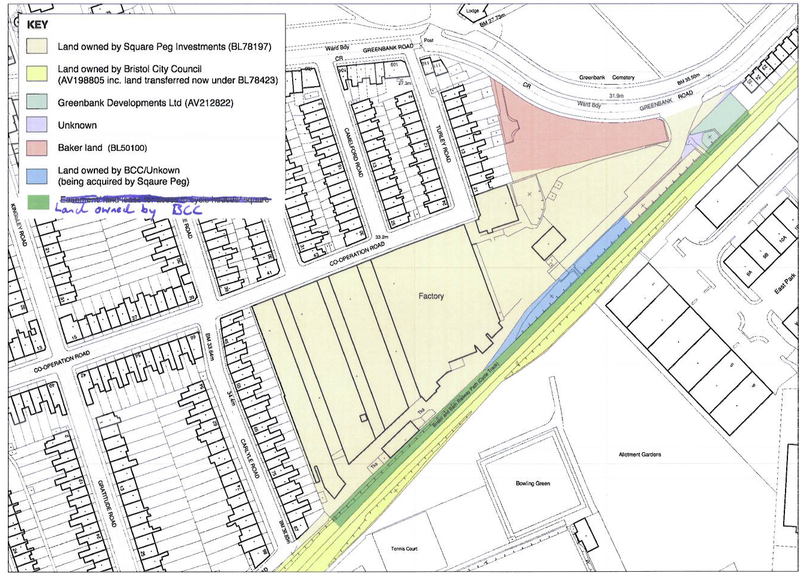 You have to click on the plan above to see the whole of it, including the blue coloured land that is being sold. The green coloured land is where the developer wants permission to build access ramps from the tarmac path to the houses which we understand will lie along the northwest edge of the green land. Hi everybody, some local residents have now set up a blog with the aim of promoting discussion on this issue. Am I the only one outraged that Squarepeg have already started destroying the cyclepath verge by felling the magnificent mature ash tree ? Montpelier: it does have pavements!